Michael Whitman leads an orientation to DELTA's classroom capture services. 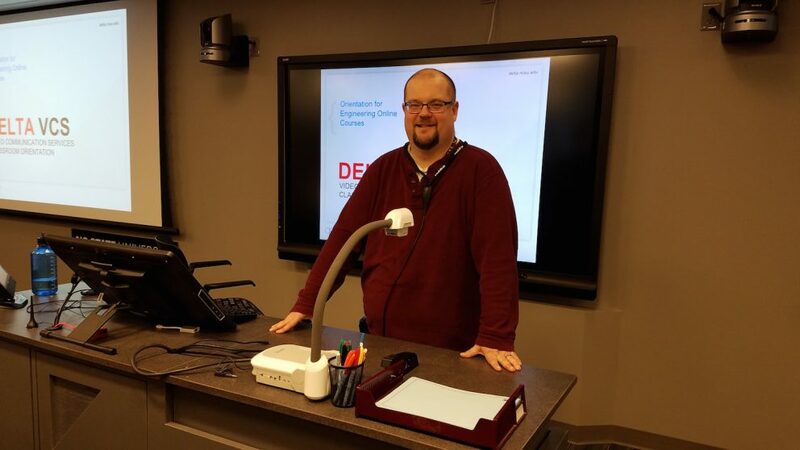 Michael Whitman is a lead classroom support technician and has been at DELTA since 2003. While his job titles have varied, his commitment to quality classroom capture has remained the same. Upon graduation from Ohio University with a degree in communication and video production, Whitman began searching for a job. He came to North Carolina for an interview with Tony Pearson and Larry Evans and found more than just a job, but a career and a place he would call home. He said the leadership at DELTA was one of the first things he noticed — leaders that he continues to learn from. 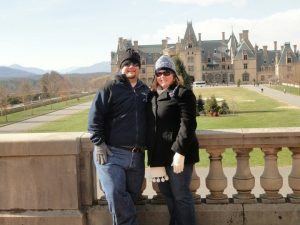 Michael and Becky Whitman at the Biltmore Estate in Asheville, North Carolina. In 2015, Whitman began working on a master’s degree at East Carolina University in Instructional Design Technology that he plans to complete in summer of 2018. Along with personal and professional growth, Whitman noted his colleagues at DELTA, including Shawn Colvin and Donna Petherbridge, were influential in his decision to go back to school. Passionate about his work and the growth of Online and Distance Education, Whitman will continue to impact students and faculty well into the future. “My job has recently changed in the last 18 months when I received a promotion to team lead,” said Whitman. He is now responsible for ensuring the team’s temporary workers are deployed to the appropriate classrooms to cover classes and help faculty with in-room needs. Along with this, Whitman described his daily tasks as support and service. “I essentially either support faculty or my fellow technicians to get classes captured,” he added. As a technician, Whitman ensures the cameras are correctly positioned and the sound is of quality. “Making sure the classes are great and the technology works helps spur student engagement,” Whitman added. Whitman’s team also facilitates video conferencing and has connected with countries around the globe. Whitman says working with faculty to impact students is one of his favorite parts of his job. “I love when I’m doing an orientation, and I’m showing the instructor a new tool or technology and they just ‘get it.’ The look they have when they think of what they can do with this [tool] and how they can implement it in their classes, that makes my job worthwhile,” said Whitman. “I also enjoy the feeling that I get when students succeed in our classes. The work we do helps create the next generation of engineers, scientists, teachers, artists, public servants and so on,” he added. “There are so many memories. I remember one class where the instructor and her students were so impressed and thankful with me and my skills that I received a gift bag from them at the end of the semester,” said Whitman. Whitman’s exceptional customer service also contributed to a German language class bringing him souvenirs from a spring break trip including a German chocolate bar. He also recalled capturing an entomology class where the instructor kept a large jar of honey in the room for months. The DELTA staff retreats were also a special memory of Whitman’s. “We would come together and energize the sense of community that we have,” he added. One retreat in particular with a lip sync contest was especially memorable for all involved. 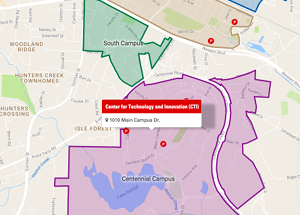 How have you seen DELTA and the distance education industry change in your time here? “Growth. [Senior Vice Provost Tom Miller] likes to say that DELTA means change, and it really does,” Whitman stated. Not only has DELTA grown and expanded, but Whitman noted the rise and significance of online and distance education both at NC State and nationally. “We used to capture one or two classes a day, now we do double and triple ups at one time.” Meaning DELTA staff in the Central Control Room are capturing two or three classes during each class time period. Whitman’s voice amplified when he began talking about the growth of distance education as a whole. Whitman explained how many on-campus students are taking Online and Distance Education courses. “You can take a distance education course and do it online. You are not on a carrier in the Pacific, you’re not on an Army base somewhere, you’re on this campus but still taking the course,” he said. The accessibility and growth of the industry really makes Whitman excited about his work. “It’s pretty energizing to know that I’ve been a part of that growth from DELTA being small at around 30–40 people to now over 100 people. I’m excited to see what change DELTA will experience over the next 15 years,” said Whitman. 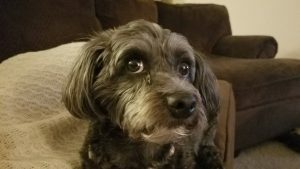 Michael and Becky’s Yorkiepoo, Murphy. “My spare time is currently taken up by graduate school — I am almost always reading, writing or submitting papers or projects for school,” said Whitman. However, he still enjoys time with his wife, Becky, and his Yorkiepoo, Murphy. “They are the best part of my day,” Whitman added. As an avid sports fan and native of Ohio, Whitman enjoys following Cleveland’s professional teams, the Browns, Cavaliers and Indians. Whitman’s Ohioan roots run strong as he served as the Ohio University Alumni Association Raleigh-Durham chapter president for six years. 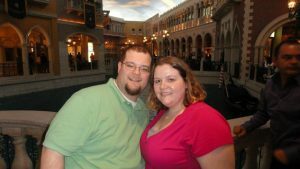 Michael and Becky Whitman in Las Vegas. In his high school years, Whitman worked at a restaurant and found he enjoys cooking, grilling and smoking meats. “I’m getting pretty good at pulled pork BBQ,” he added. “I have a lot of different interests. I like to say I’m a jack of all trades but a master of none,” he said jokingly.